Cook the linguini in a large pan of boiling salted water – the bigger the pan the less chance of sticking and it is a good idea to give this type of pasta a stir occasionally. This can take between 3-5 minutes from boiling – check with the packet instructions, they all vary. Pour the cream into a pan and bring to the boil, then boil for 2-3 minutes to thicken slightly, stirring occasionally. Remove from the heat and stir in the Parmesan, then season with pepper. The heat of the cream should melt the cheese. 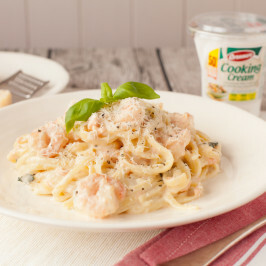 Drain the pasta and toss with the Parmesan cream, finally fold in the smoked salmon and prawns and basil until well combined. Divide among warmed pasta bowls and garnish with the remaining Parmesan and basil. Give each one a good grinding of black pepper and serve immediately.